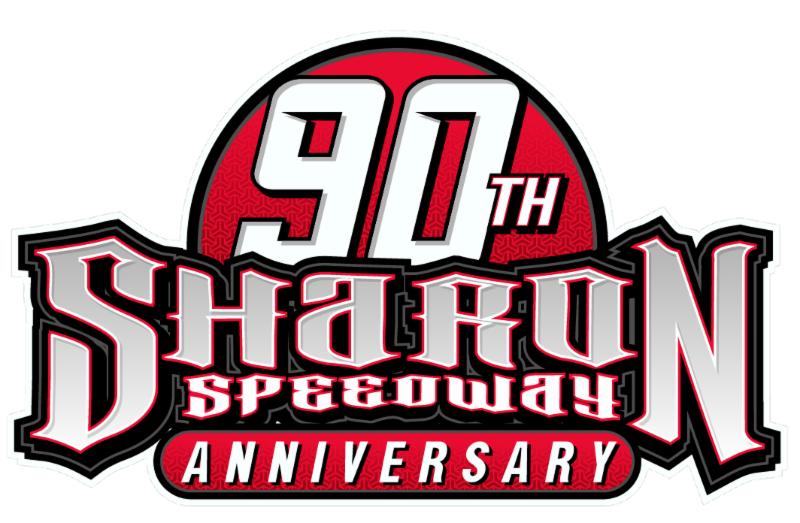 To say it was a very long Saturday night (and Sunday morning) at Auburndale Speedway was definitely an understatement as fans first had to endure an hour-and-a-half rain delay followed by three races dotted with numerous red flags, cautions and lengthy track clean-ups. Despite the action not ending until just after 1 am, a large crowd stayed to the bitter end and were treated to some fine racing between all the delays. The big race of the night was the Spring 125 for the Super Late Models presented by WPCV 97.5 Country Radio. Seventeen Super Late Model teams were in attendance and it was a big surprise when Polk City’s Josh Todd topped the time trials with a lap of 13.740 seconds in a brand new car that was “right out of the box.” Aaron Williamson timed in second quick at 13.782 just ahead of the 13.812 lap of Brandon Duchscherer who was also at the wheel of a sparkling new ride. Local veteran Chris Fontaine was fourth quick while fifth fastest was Noah “Lil’ Gator” Cornman who was impressive in his first-ever visit to the track. The invert would be an eight placing Devin McLeod on the pole for the big race. McLeod sped out to an early lead as the field raced close behind him. Lap 11 saw the first caution flag fly when Jeff Gordon spun his machine on the back stretch. Joe Boyd had the outside front row on the restart and made quick work of McLeod to grab the top spot. John Coffman looped his mount on lap 15 to bring out yellow flag number two. Boyd pulled out to a near straightaway lead by the time the next caution was unfurled on lap 34 as Gordon spun on the front stretch. On the restart, Fontaine zipped by McLeod for second. Duchscherer slipped by McLeod on lap 40 bringing Williamson and Todd with him. McLeod’s car was faltering and he dropped back to sixth while Boyd again built up a big lead. Lap 48 saw the yellow out again for a Coffman-Cornman tangle in turn one with both continuing. On the restart Duchscherer, Todd and Williamson freight-trained Fontaine to move up in the running order behind Boyd. The field then settled into some green flag racing although McLeod was continuing to have a rough go of it and dropped from the running on lap 67. Four laps later the right front tire went down on Williamson’s car and he exited to the pits in a shower of sparks as the caution came out yet again. Just after the restart a multi-car melee took place in turn four that eliminated Cornman from the running. The red flag was displayed for a lengthy clean-up of fluids on the track. Once the field took the green again Todd was on a mission as he moved by Duchscherer into second on lap 82 and set his sights on Boyd. Shortly after, Blaise Hetznecker and Steve Dorer got by Fontaine to move into fourth and fifth places. Dorer then got by Hetznecker for fourth on the 97th lap. Meanwhile Todd had moved up on Boyd to challenge for the lead as Fontaine fell from the race on lap 99 with a sick engine. A final caution flew on lap 104 as Coffman spun in turn two setting up a dash to the checker. Todd battled side-by-side with Boyd for a couple of laps but had to settle in behind him. From that point Boyd held sway to the checker with Todd right in his slipstream. Duchscherer came home third while Dorer, who had started well back in the field, coming home fourth after a fine drive. Fifth went to Hetznecker while Williamson rebounded for a sixth place effort. David King, Brian Dorer, Stuart Dutton and Coffman rounded out the top ten. Also on tap was a 50-lap run for the Brandon Ford Wheel Man Sportsman Series presented by Gagel’s Auto Parts, Racecar Engineering and Autotech Collision Center. 22 top machines signed in to do battle with Clermont’s Jason Vail topping qualifying with a lap of 14.276 seconds. Second in time trials was Aaron Williamson who tripped the clocks at 14.285 followed closely by Devin McLeod, Travis Roland and Brett Jenkins. Vail would find himself starting mid-pack as the invert was a whopping 14 cars. Despite the big field, the start was clean as Rex Struble led the opening circuit before giving way to Adam Briggs who was out front when the first caution flew on lap six for a tangle between Brett Jenkins and Mark Peterson. Vail was said to have caused the incident by getting into Jenkins and he went to the tail of the restart line-up. Struble got back by Briggs on the restart with Joe Winchell and Craig Cuzzone moving up to second and third on lap 12. Lap 19 saw Williamson and Colton Bramlett get together going down the front stretch with Bramlett going hard into the wall. Bramlett’s car was towed from the track – not a good way for the night to end for the young man who celebrated his 16th birthday the day before. Williamson pitted but returned after repairing the damage to his car. The veteran Winchell turned up the wick after the restart and snared to lead from Struble while Cuzzone slipped into second on lap 26. One lap later, Briggs spun to bring out the yellow and he took his mount pit side. Meanwhile, Vail had moved into the top ten with Williamson also charging back into 11th. The restart was aborted when Brett Jenkins and Rick Reed got together on the front stretch, however both kept going with minor damage. The next attempt saw Williamson spin in turn three as something broke on his machine. He pitted but did not return. Try number three saw a massive mess take place off turn four. When the dust settled, the cars of Brandon Morris, Vail, McLeod, Steven O’Steen and Shawn Jenkins all had damage. All but Jenkins stayed in the running. Action resumed but only for a pair of laps before Cuzzone and Struble tangled coming down the front stretch with both spinning wildly into turn one. Cuzzone was done for the night while Struble continued. On the ensuing restart McLeod moved into second spot bringing Travis Roland with him just before Brandon Martin spun on the front stretch to bring out the caution on lap 31. McLeod out-gunned Winchell on the restart and grabbed the lead with Roland following him into second. Winchell was now being hounded by Vail for third. The final yellow flag flew on lap 45 as Brett Jenkins spun in turn three. The old term “rubbin’ is racin'” held sway on the last restart as there was plenty of contact among the leaders. McLeod held his own while Vail made a banzai charge to second. Winchell and Roland traded paint with Winchell grabbing third at the checker followed by Roland and Morris. Jesse Henley finished off a steady run with a sixth place effort while Brooke Storer, Struble, Mark Peterson and Brett Jenkins completed the top ten. The Legend Cars were in action for 25 laps with 13 cars in the starting field. Old pro Mitch Verhaagh zipped into the early lead but action came to a screeching halt on the third lap when the engine exploded in Taylor Hosford’s car going into turn three while she was running third. Despite a massive amount of smoke, Hosford guided her car into the infield while everyone else avoided any major altercations. On the restart a traffic jam took place in turn four with half of the remaining field involved. Everyone was able to continue. Jim Smith sped to the point on the restart only to see the caution fly yet again for a tangle between Alan Hiefnar and Joey Langis. Then on the restart it was Mike Verhaagh and Blake Boyette tangling in turn one. From that point it was all green as Smith made quick work of the field. Seth Adams was looking strong in a guest stint driving for Dave Fusco, moving up to second before falling out with mechanical ills late in the going. Kyle Pitts made a late charge but had to settle for second behind Smith who claimed his first career Legend Car feature win here. Mitch Verhaagh capped a great run with a third place finish ahead of Hiefnar and his brother Mike Verhaagh. Sixth went to Langis while Sam Cornman, Gavin Sexton, Bob Wilson, Boyette, Cale Nolen, Adams and Hosford completed the finishing field. It was another family affair in the Q Mini Stocks as Chris Narramore, Sr. took the lead from Bruce Cozad on the 17th lap then sped to victory over his son Chris Narramore, Jr. Cozad held on for third ahead of Fred Martin, Tav Gary, Duker Holley, T. J. Tanner and Donald Gatlin. 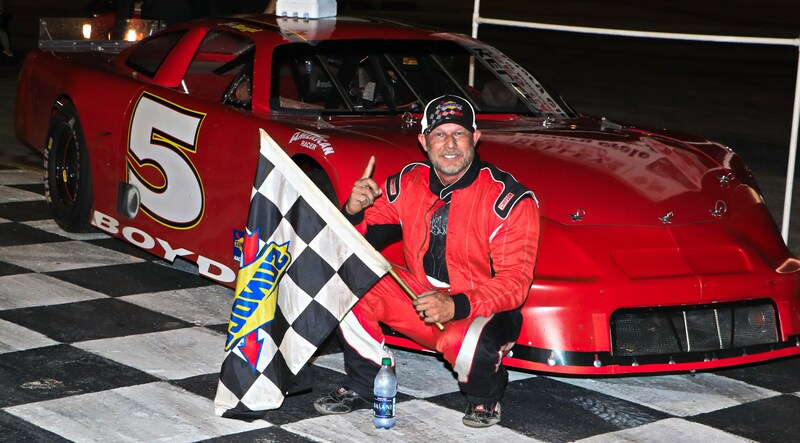 Douglas Harrin, Jr. dominated the Mini Cup feature for his second win in a row. Brey Holmes brought Bill Rychel’s machine home a distant second over Clay Samuels, Bryton Horner and Doug Higbie. Maria Martins did not start.